Albert Mashika, development coordinator at Caritas Congo, explains why the question should be addressed urgently as the effects of climate change may threaten food security and trigger new violence. Mr. Mashika, you believe that developing countries should get more involved on climate change issues. What is at stake in Congo ? Albert Mashika : Climate change is an essential problem for developing countries. They are the first victims of its effects. We in Congo directly experience the consequences, mainly on food security and security in general. In some regions, the rain levels are now much lower which is bad for the agriculture. The water of the Tanganika lake is warming up, leading to a drop in algae. This will certainly reduce fish stocks. A food crisis is already developing in some parts of the country. Not only children, but also adults and especially pregnant and breastfeeding women could be affected by malnutrition. In some dioceses, indigenous populations who survive on picking wild plants complain of decreasing numbers of mushrooms and caterpillars. Their entire way of life is threatened. Climate change can trigger violence as well. 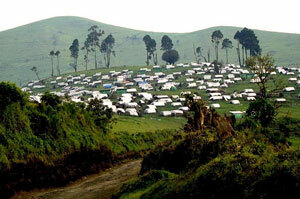 The bed of the river Semliki, the natural border between Uganda and the Congo, is being displaced because the Rwenzori mountain’s icecap nearby is melting. This leads to a shift in the border between the two countries. And there seems to be oil in the ground beneath. So both countries will try to benefit from the change to expand the borders of their country. This could become a conflict. Albert Mashika : We have launched a survey in order to gather information from all dioceses and then, we will organise a forum on the question. Apart from that, we are already running projects in several dioceses. We are providing improved, highly resistant seeds to vulnerable populations so that they can adapt to the effects of climate change. Getting climate change issues to figure in the next growth and poverty reduction strategy document is another priority for us. This document is an advocacy tool and action plan for our country that is elaborated by a specialist group composed of government officials, representatives of civil society organisations and development partners, such as the World Bank, the African Development Bank and the European Union. Congo has been struck by years of conflict and war. Is climate change really a priority concern for the population ? Albert Mashika : It absolutely should be. If we do not take into account the effects of climate change, then we are slowly heading toward some sort of silent tsunami. When consequences will show in terms of war, food crises and malnutrition, we will witness a real disaster. It is in our interest to address the question, not only in Congo but all over Africa. We should start projects in secured zones of Congo but the conflict shouldn’t keep us from starting to take action. What sort of renewable energies could be promoted in the Congo ? Albert Mashika : We could promote the use of solar panels. Congo is on the Equator, the weather is sunny all year long. In rural areas, ‘improved stoves’ also have great potential. They consume very little wood to cook the food. The technique has proven to be effective in North and South Kivu. These stoves don’t pollute the kitchen as they give off very little smoke and are very economical. The awareness on climate issues also needs to be raised in schools. Children should be involved in reforestation projects. Big companies exploiting the resources need to be held responsible for their social and environmental impact. Hydro-electrical micro-dams are another interesting option for many rivers in Congo. In order to implement this change, we would need more support from developed countries. The outcomes of the Copenhagen summit were rather disappointing in that sense even though it showed a certain political will from the Western countries to address the issues of climate change in poor countries. The developed countries are supposed to spend 0.7% of their GDP on development aid but few of them do so. That is a pity because investment, for example in the fields of renewable energies, could serve the climate but also trigger long term economic development here.